Once the summer is on it’s way, I like to keep my hair curly. It’s a chore for me to set my hair in rollers every week and then sit under a dryer. Ever since Cristi taught me how to use a diffuser two years ago, it has been even easier to maintain curly. The only problem I had was for sleeping. I didn’t like that my curly hair would sometimes get all knotted up at night. I toss and turn a lot. 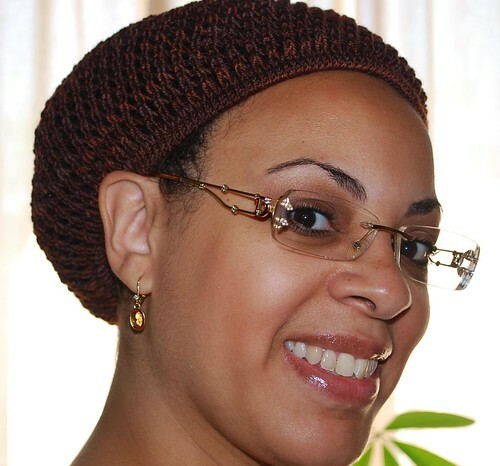 I have several tight handmade crochet hair nets to sleep with when I wrap my hair when it’s straight. 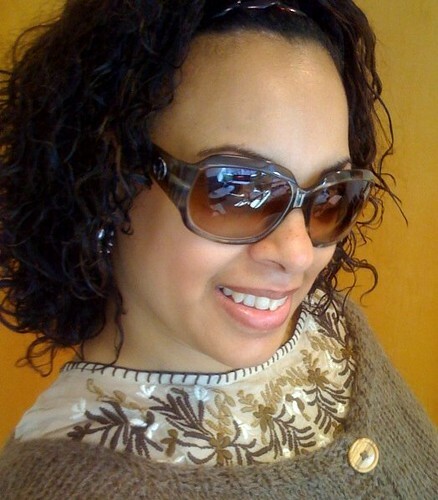 I bought a loose one at the beauty supply to try on my curly hair and it started unraveling after just a few uses. So, in comes A Little Nightcap. Perfect for keeping my hair in curls at night with no knots in the morning. I am a happy camper! 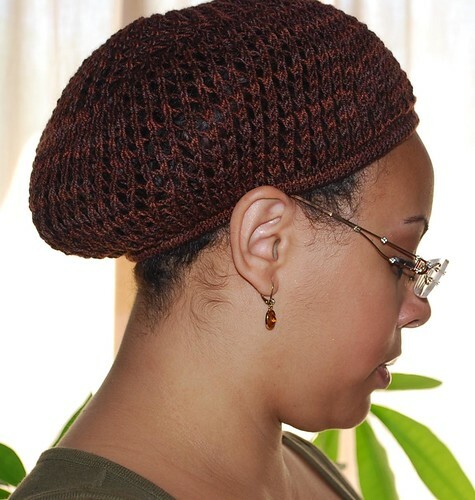 You can make it small enough for a bun net, too. A special thank you to Sara (BaconPony on Rav) for helping me name my cap and winning one knit by me in the process. 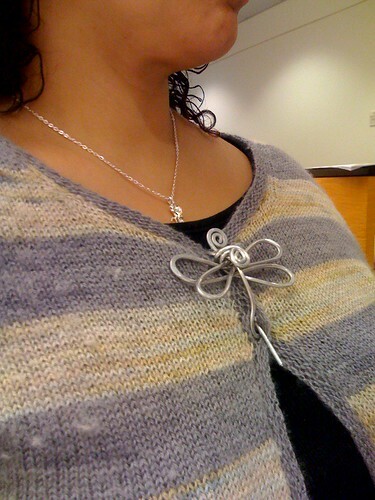 A Rosi G. design. Ravel it for your free pattern download. I finished my new Tempest just in time for MDSW! 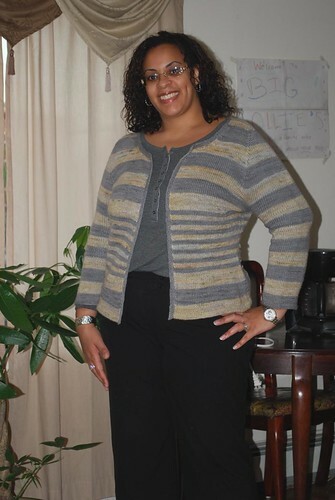 Scroll all the way past the pictures for my mods because I basically rewrote the whole pattern to a set-in sleeve, seamless cardi. 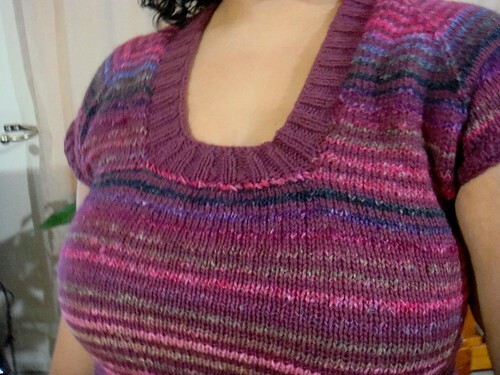 I am still calling it a Tempest because I used the same stripes and the stitch counts from the original pattern. I hope to find some sock yarn to do my next one in because there WILL be a next one! Needles: US 6 needle for the body; US 5 needle for the edging; US 10 needle to bind off (regular bind-off but YO every 2 sts on front edges and every 3 or 4 sts on neck edges). 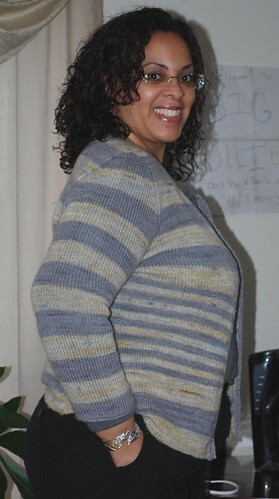 Mods: I knit this sweater as a seamless set-in sleeve cardigan a la E. Zimmermann, following instructions in the Knitting Workshop book.The body is done in one piece: using two circular needles and Judy’s Magic Cast On, cast on left front sts, PM, cast on 1, PM, cast on back sts, PM, cast on 1, PM, cast on right front sts. The single stitch between markers will be knit in reverse stockinette to make that the pretend side seam. Continue knitting on your main body needle only. Leave the second circular with it’s live sts dangling for now. Work 14 rows. Fold your strip with WS touching and take your dangling circular and align it with your working circular. Now you will do a 3-needle bind-off without the binding-off part to join the two pieces (basically, knit one st from front needle an done st from back needle). You’ve done your hem. 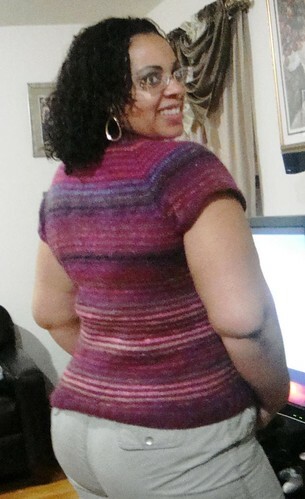 Knit as directed in pattern, including all waist shaping until you get to the armhole decreases. At this point, knit to X sts AFTER first side seam stitch, where X represents the # of sts you were to have decreased for the armhole on the back. Take the X number of armhole sts from the front, the single “seam” stitch and the X number of armhole sts from the back and put them all on a holder. Smack in the middle of all of these sts be sure to include the single side seam stitch. Continue knitting to the other side and repeat. Set aside. Knit your sleeves in the round from the bottom up including all shaping until you get to where you would decrease for the armhole. 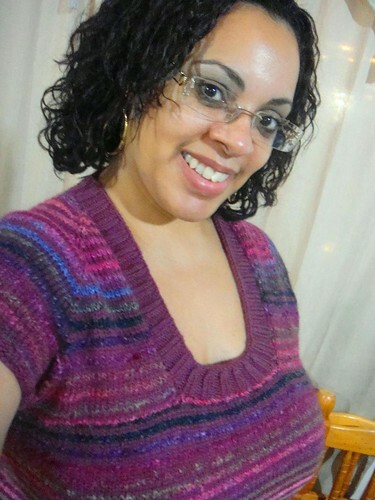 I knit the first 4 rounds in garter stitch. Follow the same instructions as body for placing X sts for the sleeve underarm on a holder. This number should be the same number as those at the underarm on the body. Next, join all of your pieces onto one long circular as follows: knit right front sts, PM, knit sts from one sleeve, PM, knit back sts, PM, knit sts from second sleeve, PM, knit left front sts. You will then do the set-in sleeve decreases at the markers as shown in the EZ book, except don’t increase the rate of decreases to every row once you have half of the sleeve sts. I continued with 1 decrease every RS row. Also, all of my decreases were done as p2tog or p2tog-tbl on the RS and k2tog or ssk on the WS so that you create a fake seam along the armhole. 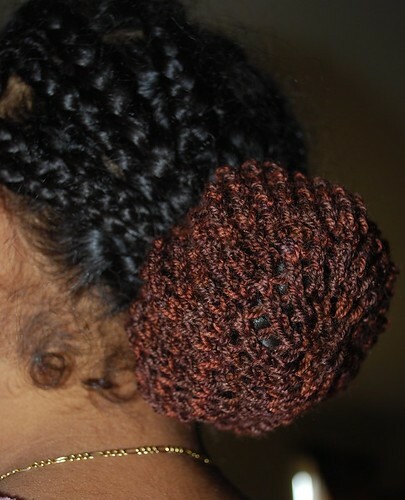 A few short rows done on top edge of back. Picked up 3 sts for every 4 slipped sts along front edges, 1 sts for every stitch along neckline. I only did 11 buttonholes for this Tempest. With my first Tempest, I feel 14 buttons is too much. But as I said above, I’m not sure if I’m going to sew on the buttons because I like it with my dragonfly pin from Nicholas and Felice (they have some nice new things on there too…hmmmm). All in all, VERY pleased with this new one. Because I’m the type of person that when she sees something shiny, she runs after it, after seeing the progress on Cristi’s gorgeous Striped Tomato, I knew I wanted one. Pick up the new color and knit one round. 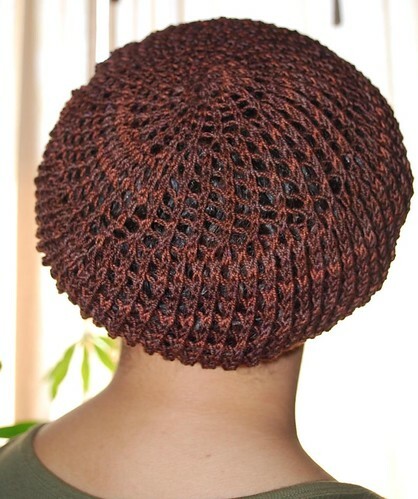 Knit as many rounds as needed in this new color. Repeat from #1 for as many stripes as you have. The yarns I used, Noro Silk Garden and Ella Rae Classic, work very well together. This top is verrry soft to me and feels great when worn. I went with the solid for the ribbed edgings on the sweater. 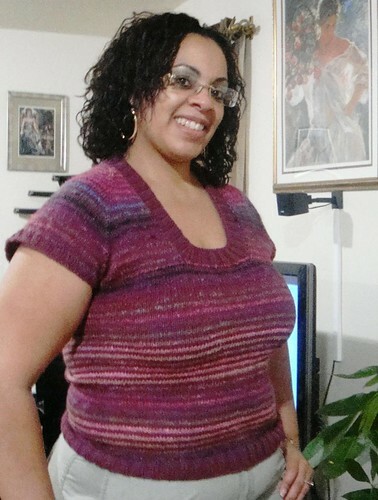 All in all I’m TOO pleased with this great top that fits nicely and was a pleasure to knit. At the end, I almost didn’t even want to bind off! Thanks for the inspiration, Cristi! Mods: Obviously, I did striping instead of the fair isle in the original Tomato pattern. I only decreased 3 times for the waist instead of 4; and, increased 3 instead of 4. I cast on 8 sts at the armhole instead of the few called for by the pattern for better fit under the arms. Dear Lord, I pray for Wisdom, to understand a man, to love and to forgive him, and for Patience, for his moods. Because, Lord, if I pray for Strength, I'll just beat him to death.